About This beautiful English sundial is made from Limestone and features a Corinthian capital Condition report There is an old repair to the column. The who item comes in four parts ( the sundial is not attached). Chips to the surface of the sundial. 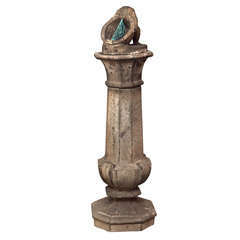 Style Neoclassical Date of manufacture Early 20th century Materials and techniques Hand carved, limestone, bronze, ceramic Wear -Wear consistent with age and use -Minor losses, scuffs and scratches -Historic repairs -Recent repairs Dimensions: Height 101 cm 115 cm to top of sundial Gnomon Base stone 38 x 32 cm Sundial diameter 22 cm Weight 60 kg. 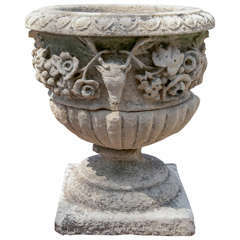 Limestone garden decor with a gadroon, flower, and swag design. Hand carved in Italian limestone this crawling snail is on a flat uneven grotto base partially adorned with leaves. Wear consistent with age and use. 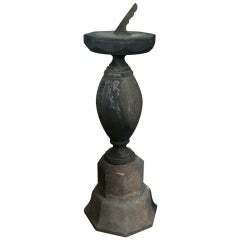 A nicely sculpted Louis XVI style limestone urn-form finial, with two handles, the perfect size and height for use as a garden seat, 19th century, French.